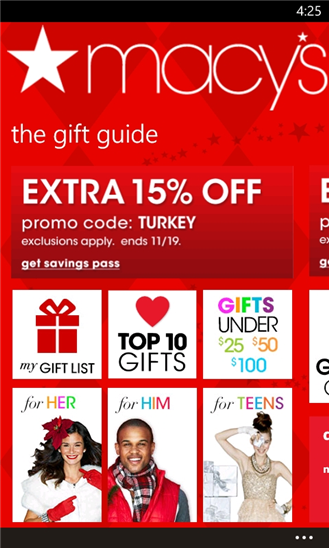 Its official, the Macy’s department store app for Windows Phone 7.x and higher is now available just in time for the holidays! For those who don’t know, Macy’s is a U.S. chain of mid-range to upscale department stores. The app looks amazing and it is sure to be a hit with shoppers everywhere during this time. Check it out the full app description and photos below! 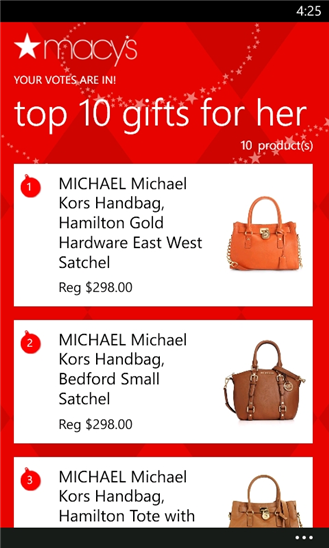 The latest version of Macy’s app for Windows Phone 8 puts everything right at your fingertips. Enjoy special offers & in-store savings, shop for gifts in our Holiday Gift Guide, manage your account, view product details & more. Holiday Gift Guide: Shop for holiday gifts on the go! 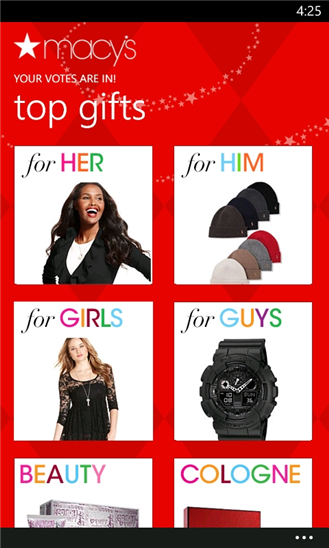 Find gifts for everyone on your list, check out our top gifts and shop Gifts from our Stars! My Gift List: Upcoming birthday? Not sure what to give family & friends this Christmas? Our app makes shopping for everyone easy! Create personalized wish lists or add items to your shopping bag in one easy step. Also receive birthday reminders right on your phone! Find a Store: Our store locator is faster than ever, featuring an easy-to-use interface, saved prior store search and location detection. Special Offers: Enjoy discounts, offers & promotions. My Account: Update your personal information & pay your Macy’s credit card bill right from your phone. Written by: MBGW on November 24, 2012.